Ideal as a dipping sauce for spring rolls, fried chicken, roast chicken, fried fish and fries. Excellent for steaks, lamb / pork chops, all types of chickens, grilled / fried fish, tuna / shrimp / chicken sandwiches, hot dogs, hamburgers, tacos etc. Can be use to spice up salad dressings. 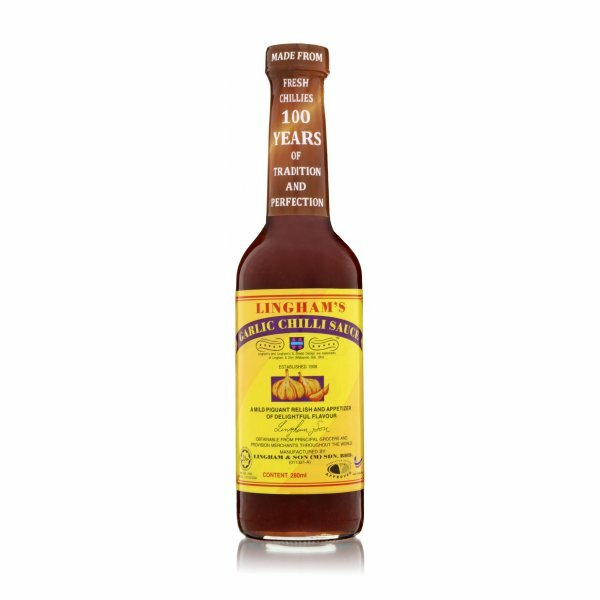 Combine 6 ounces of your usual brand of ketchup with 1 tablespoon of Lingham's chilli sauce. Add a teaspoon of Lingham's chilli sauce to 3 teaspoons mayonnaise or 1000 island dressing. Stir well and use as a spicy salad dressing, on coleslaw or as a dip for french fries or crudites. Recipe may be doubled or trebled as desired. You will be glad you did it. If there is a separation of the contents, it means that the chillies are floating on the sugar. There is no deterioration of the product. A good shake of the bottle will return the product to a uniform mix. Chilli (30%), Garlic (20%), Sugar, Vinegar, Salt. It contains no preservatives, artificial flavours, colouring or bulking material.